Shipped With Wall Hanging Tag. Water Proof For All Weather Application. You need CEN0027 software to operate this logger. At least 1 set of software is needed. 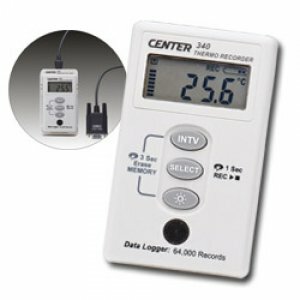 CEN0026-340 are temperature data logger. Even though these units are focus on data collecting, we had place a LCD display to show the operator on site information. In case of dark environment, it is even equipped with back light display. Both units feature a real time clock inside so that the events are captured with time stamps. The recording memory can hold up to 64,000 records which can produce high resolution test result. With water proof housing, the temperature data logger has a lot of applications such as environmental monitoring, food transportation process monitoring or air condition monitoring etc. The data is download through IR photo interface so we do not have to worry about connector might be damaged by water. Option: Communication Base(CEN0027), RS-232 Cable, Software SE-345.